For all you CA owners looking for a standalone system that is far superior to your normal ECU, better than SAFC-2, Power FC, Emanage, SDS…. This write up is for your basic CA18DET into a 240sx and utilizing the FORD EDIS-4 ignition system and Megasquirt II. Before we begin lets compile a list of what is needed, what options there are, prices, etc etc. I will indicate what is optional. You have your choice of Megasquirt I and Megasquirt II as well as V2.2 and V3.0. I suggest going with Megasquirt II V3.0, yes its a little more expensive ($80 more) but will make life a little easier and it allows the use of Low Impedance injectors without the need of a Flyback board that is required with V2.2 boards. Also V3.0 has the flyback board built in so thus why V3.0 is the choice to go. One of the places I recommend getting all your Megasquirt kits, parts, etc etc. is http://www.DIYAUTOTUNE.com Jerry is probably one of the biggest dealers in the megasquirt community. His kits are properly labeled and more organized than the other dealers. Another note if you dont know how to solder parts onto a board, go to RadioShack get yourself a practice kit. Now that that’s out of the way, on to to the write up. http://www.DIYAUTOTUNE.com sells wiring harness kits in which all you have to do is splice the sensors, fuses, relays, and you’re good to go. They even sell assembled ECUs so if building it scares you they do have you taken care of for a price. This is the Megasquirt Kit. FORD EDIS-4 Module- $Free at local junkyard. 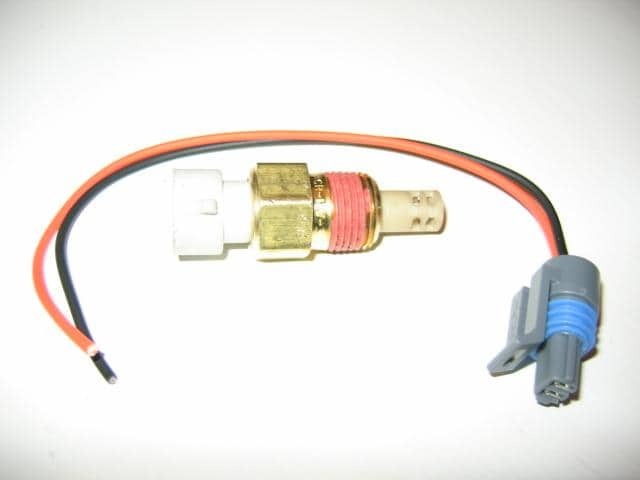 FORD Radio 25uF Suppression – Comes with Coilpack harness. Thats all for the EDIS parts. Make sure when getting the Ford parts you get the harness with at least 6″ of wires. The FORD EDIS-4 parts can be found on 1991-1995 FORD Escorts. The module is located on the driver strut, coilpack is a few inches away you can’t miss it. The VR sensor and Crank Trigger are on the passenger side of the motor. The Crank Trigger is pressed on but with a big flat head screwdriver and hammer should pop it off with several hits. Everything is inside the engine bay. Here is a pic of everything. Now that the parts list is complete, on to the assembly of Megasquirt II. I’ll be straight forward and say when you get the kit, you’re gonna use all of it except several pieces. When you look at the kit you’ll see lots of holes etc etc. On the board each spot has letters and numbers. For example if it says R13 on the package that means that piece goes to R13 on the board. Also the letters give you a idea what piece is that for example R stands for Resistor, D stands for Diode, C stands for Capacitor etc etc. NOTE: Some parts are actually polar sensitive, for example – some Diodes have a line on it, if you look at the board it also has a line where the diodes go match those lines up. Same goes with the IC sockets theres usually a notch on it just match it on the board. Here is a picture of the components you must not install. NOTE:D1 and D2 must not have a Diode but you have to jumper them. You can use wire, sniped of lead. Both have to be jumpered. Leave C30 and C12 empty, nothing goes there. jumper TSEL to OPTOUT on the bottom side of the PCB, near the center. jumper JS10 to IGN (this uses the processor port for the SAW signal directly), jumper XG1 to XG2 on the bottom side of the PCB, near the 40 pin socket. Once that is done, Megasquirt will be ready for EDIS.Now you may install the the MSII chip which is a daughter board. Do not power up megasquirt yet via the stimulator. Make sure the MSII daughter board has a jumper on it. Most of the time the dealers already put it on for you but they don’t install the code for you. Before powering up Megasquirt you need to download a program to burn the code to megasquirt. The program can be found here. After downloading and installing the program you’re not done yet, you need to download the code – it’s found on the megasquirt site. There are 3 files. You only need 1 which it says at the moment. Dont worry about Pin 7 on the EDIS module you can delete it, the ground is inside the shielded wire for the wires that go to the VR sensor and Megasquirt. Some of you guys might ask, “What about TACH?”Good news – take pin 2 from the EDIS module and just wire it to your Cluster harness, wire it to the Yellow/Red wire which is your tach wire and that’s it. I did it and its acurate, I checked 2 rpm sources from Megaview and Megatune all were dead on. I decided to use GM sensors as megasquirt comes set to use GM sensors. If done properly you should only need to drill and tap one sensor which is the GM Coolant Sensor to replace the stock sensor. The stock sensor is M12x1.75, the GM sensor is 3/8 NPT. Everything else is set to go. Also for the Intake Air Temp sensor I purchased a Open Element IAT sensor. Open is suppose to be used on Turbo/Super Charged motors as the reading are faster and more responsive. I added a Fuse block instead of tapping into the stock fuses, this made for a clean setup and seperate from the car. The fuse block is only for Megasquirt so any trouble shooting is cake. They can be had at local parts store for about $3. Fuses not included. Here is a pic of my harness, along with how I set it up. Now to wire the fuel pump – it’s extremly easy. When coverting to Megasquirt, do not throw away your KA harness, you might need several plugs.If you look where your stock fuse block is near the battery, look for a brown plug which has 8 prongs. It’s E10 in the 1991-1994 240sx FSM in the EL section at the end in the wiring diagram section. Once you locate that brown plug look for the wire that is Black/Pink.Take the megasquirt fuel pump wire which is 37 on Megasquirt and wire it to the Black/Pink wire and that’s it, fuel pump is done. Now your main relay, I cheated and just spliced into the ignition switch harness. I spliced into the Black/White wire, but after the plug it becomes Black/Red.So you can splice into that, you can take the power wire from megasquirt and the module make it into one and splice into the Black/Red wire. You will need to eventually add a fuse and relay between those wires. That’s it for wiring. Next comes hardware. The trigger wheel which is a 36-1 (36 minus 1) tooth wheel. So it’s 35 teeth with a gap. One of the things you need to decide is where and how you’re going to mount the trigger. I mounted mine on front of the crank, since I’m not using power steering, I had a machine shop mill down the front of the crank and had it pressed on. You want the GAP to line up with marks on the crank pulley which is the 2nd mark for 0* TDC. This is important because with EDIS-4 since its a 4 Cylinder you need to set it 90* ahead which is exactly 9 teeth ahead of the gap. Makes sense to use 90* because in a 4 cylinder each 90* represents 1 cylinder.This link can provide more info on EDIS if my write up isnt as clear or if you’re a little confused. Here is a pic of my Trigger mounted. 0.030″ – 0.060″ (.75mm – 1.5mm) away from the trigger wheel.If you look where the alternator and crank pulley area you’ll notice 2 bolts. I used those 2 bolts for my bracket. Came out nice. I’m sure there are other ways to set it up, but don’t be scared – the CA community here on NICO will provide plenty of support. Now it’s time to move onto ignition such as spark plug wires, and coilpack. IIf you saw my previous picture I have my coilpack mounted inside the cabin and made a hole for the spark plug wires to go through and onto the motor. After all that is done, the rest is buttoning up everything and cleaning up. After you’re all set and everything is good, go ahead and turn the key to Accessories, check everything is good, then turn to On see if everything is good, check for fuel pump priming. Go ahead and connect the computer to megasquirt – Now you need to do a TPS calibration.Turn the key to when megasquirt gets power but doesn’t crank, you may disconnect fuel pump harness just in case. Where it says Closed just click “Get Current”.Now press pedal in for WOT and click “get Current” I believe it should be like 1500 somewhere in the 1000.After that is done go ahead and crank it it should fire up, if not try going back and checking mistakes. Dont forget to reconnect Fuel Pump if disconnected. If it runs, congratulations!You’re done, only thing left is tuning.